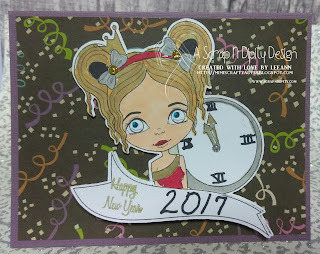 Greetings friends, today is my first post with Scrap N' Dipity and I am so excited to be here. With 2016 ending and 2017 beginning, I thought I would start off with a New Year's Card. Using a the Jaimz- Happy New Year! Using Spectrum Noir markers I colored the image up. Background paper is from DCWV, and the Happy New Year stamp is from Joy Clair. I hope you have enjoyed this project. Please follow my blog to stay up to date on my posts.